the run that changed your life. As all of us in the running community continue to take roll call accounting for our running clubs, friends, family, and acquaintances who were running Boston on Monday, let us still keep those who were less fortunate in our thoughts and prayers. While details are still unfolding, I had a feeling in my heart to do something in my community to honor those who were killed and injured. I decided to invite runners out for a 2-mile run at Lake Hefner to honor those killed and injured. My thought was, although I can’t do a lot from Oklahoma, I can do something, and that something matters. 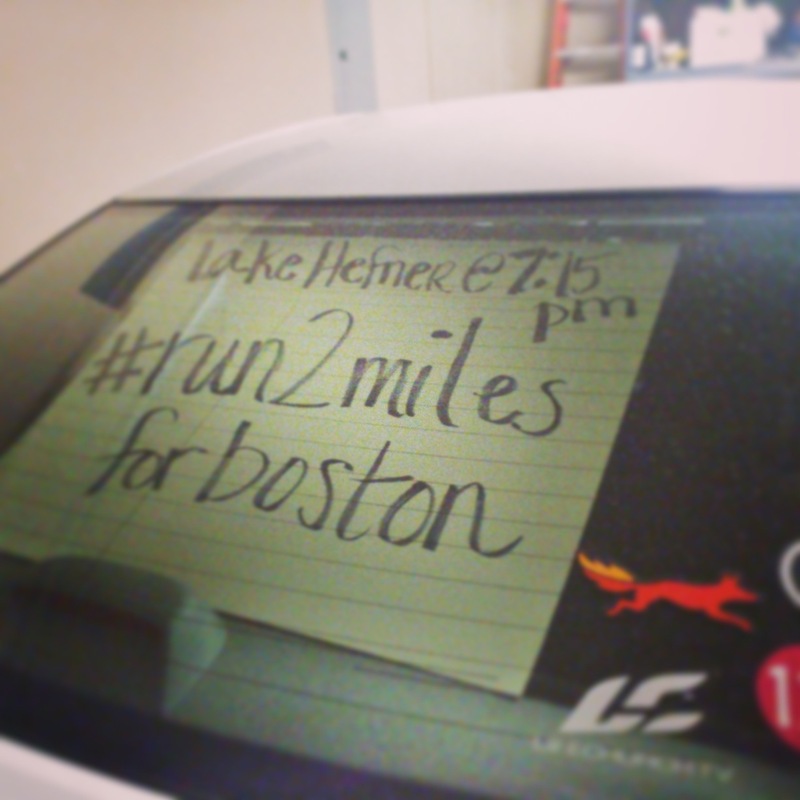 I decided to #run2milesforboston and invited all my friends locally and virtually to join in. Why it matters to me? Even though details are still unfolding, as I mentioned earlier, this was not an attack on the Boston Marathon. The majority of people affected were in the crowds. The crowds consisting of our mentors, supporters, and believers. This was an attack on people that without, this race is nothing. These are the people we look forward to seeing at the finish line. People we long to see after experiencing 26.2 miles. The ones who push us to carry on. The ones who embrace of with a hug and kiss for our efforts. The ones who cry with us with overwhelming emotions of achievement. The ones that tell us, “you’re almost there” or “you got this” or “looking good.” The ones you run 26.2 miles for. My eyes swell with emotion writing this. Life changers await at the finish line. Races are nothing without crowds in the stand. This was a senseless crime which should have never happened. Without Martins, Krystles, and Lus our 26.2 miles are in vain. My heart aches for you and your families for doing what we runners appreciate so much. Thanks for believing in us. Thanks for supporting us. Thanks for encouraging us in the final leg. We love you and you will be greatly missed in this life. I am praying for comfort and understanding in such confusing times. This run has changed so many lives in so many ways. It’s not about the medals, bumper stickers, or PRs. It’s about community. Martin, Krystle, and Lu, thank you for changing my life. Thanks for being believers, supporters and mentors. You were taken from this Earth too soon. This entry was posted in Encouragment, Fitness and tagged Boston, Boston Marathon, Krystle, Lake Hefner, Lu, Martin, Thank you. Bookmark the permalink.